"The Calms" redirects here. For other uses, see Calm (disambiguation). Infrared image from GOES 14 showing the Intertropical Convergence Zone. 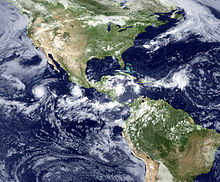 Hurricane Bill (2009) is at far right. The South Pacific convergence zone (SPCZ) is a reverse-oriented, or west-northwest to east-southeast aligned, trough extending from the west Pacific warm pool southeastwards towards French Polynesia. It lies just south of the equator during the Southern Hemisphere warm season, but can be more extratropical in nature, especially east of the International Date Line. It is considered the largest and most important piece of the ITCZ, and has the least dependence upon heating from a nearby land mass during the summer than any other portion of the monsoon trough. The southern ITCZ in the southeast Pacific and southern Atlantic, known as the SITCZ, occurs during the Southern Hemisphere fall between 3° and 10° south of the equator east of the 140th meridian west longitude during cool or neutral El Niño–Southern Oscillation (ENSO) patterns. When ENSO reaches its warm phase, otherwise known as El Niño, the tongue of lowered sea surface temperatures due to upwelling off the South American continent disappears, which causes this convergence zone to vanish as well. The ITCZ moves further away from the equator during the Northern summer than the Southern one due to the North-heavy arrangement of the continents. In some cases, the ITCZ may become narrow, especially when it moves away from the equator; the ITCZ can then be interpreted as a front along the leading edge of the equatorial air. There appears to be a 15 to 25-day cycle in thunderstorm activity along the ITCZ, which is roughly half the wavelength of the Madden–Julian oscillation (MJO). Within the ITCZ the average winds are slight, unlike the zones north and south of the equator where the trade winds feed. Early sailors named this belt of calm the doldrums because of the inactivity and stagnation they found themselves in after days of no wind. To find oneself becalmed in this region in a hot and muggy climate could mean death in an era when wind was the only effective way to propel ships across the ocean. Even today, leisure and competitive sailors attempt to cross the zone as quickly as possible as the erratic weather and wind patterns may cause unexpected delays. Tropical cyclogenesis depends upon low-level vorticity as one of its six requirements, and the ITCZ fills this role as it is a zone of wind change and speed, otherwise known as horizontal wind shear. As the ITCZ migrates to tropical - subtropical latitudes and even beyond (Shandong province of the People's Republic of China) during the respective hemisphere's summer season, increasing Coriolis force makes the formation of tropical cyclones within this zone more possible. Surges of higher pressure from high latitudes can enhance tropical disturbances along its axis. In the north Atlantic and the northeastern Pacific oceans, tropical waves move along the axis of the ITCZ causing an increase in thunderstorm activity, and under weak vertical wind shear, these clusters of thunderstorms can come. Thunderstorms along the Intertropical Convergence Zone played a role in the loss of Air France Flight 447, which left Rio de Janeiro–Galeão International Airport on Sunday, May 31, 2009, at about 7:00 p.m. local time (6:00 p.m. EDT or 10:00 p.m. UTC) and had been expected to land at Charles de Gaulle Airport near Paris on Monday, June 1, 2009, at 11:15 a.m. (5:15 a.m. EDT or 9:15 a.m. UTC) The aircraft crashed with no survivors while flying through a series of large ITCZ thunderstorms, and ice forming rapidly on airspeed sensors was the precipitating cause for a cascade of human errors which ultimately doomed the flight. Most aircraft flying these routes are able to avoid the larger convective cells without incident. ^ Barry, Roger Graham; Chorley, Richard J. (1992). Atmosphere, weather, and climate. London: Routledge. ISBN 978-0-415-07760-6. OCLC 249331900. ^ "Inter-Tropical Convergence Zone". JetStream - Online School for Weather. NOAA. 2007-10-24. Retrieved 2009-06-04. ^ "Inter Tropical Convergence Zone (ITCZ) - SKYbrary Aviation Safety". www.skybrary.aero. Retrieved 2018-04-12. ^ E. Linacre and B. Geerts. Movement of the South Pacific convergence zone Retrieved on 2006-11-26. ^ Semyon A. Grodsky; James A. Carton (2003-02-15). "The Intertropical Convergence Zone in the South Atlantic and the Equatorial Cold Tongue" (PDF). University of Maryland, College Park. Retrieved 2009-06-05. ^ Djurić, D: Weather Analysis. Prentice Hall, 1994. ISBN 0-13-501149-3. ^ C.-P. Chang, J.E. Erickson, and K.M. Lau. Northeasterly Cold Surges and Near-Equatorial Disturbances over the Winter MONEX Area during December 1974. Part I: Synoptic Aspects. Retrieved on 2007-04-26. Wikimedia Commons has media related to Intertropical Convergence Zone. Duane E. Waliser and Catherine Gautier, 1993: A Satellite-derived Climatology of the ITCZ. J. Climate, 6, 2162–2174.